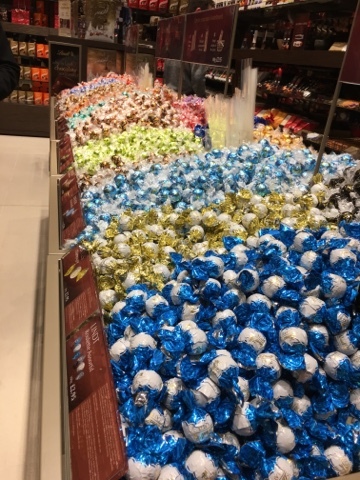 We happened to be near Resorts World, Solihull (the most confusing shopping centre ever - it's just small versions of good shops) and popped into one of the main reasons to visit - the Lindt Shop. Here they have everything that you could realistically want a chocolate shop to contain. 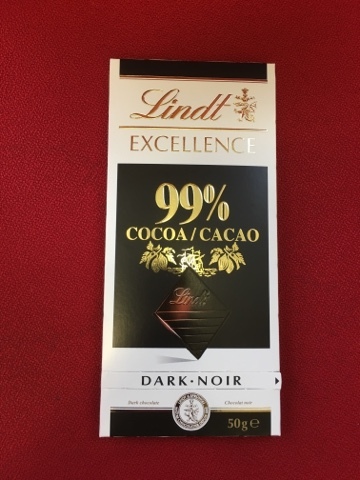 Including the rare holy grail of the dark chocolate enthusiast - 99% Dark. This is £2.40 for 50g, and you get warned by the shop assistant that it's not really snacking chocolate and to keep water near-by. It also has a built in caution into the amazingly stylish box. 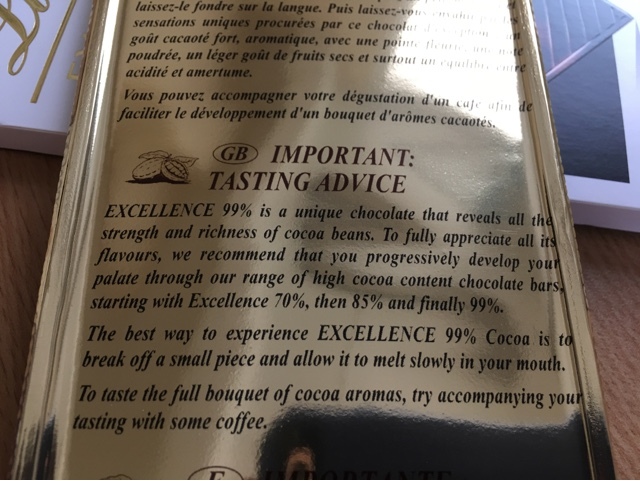 Well we've had 70%, and 85% and a variety of 90% versions over the years but never made it to the magical 99%. This is almost the definition of refined, as short of eating raw cocoa powder off a spoon then this is as concentrated as it gets. The packaging is very inviting. 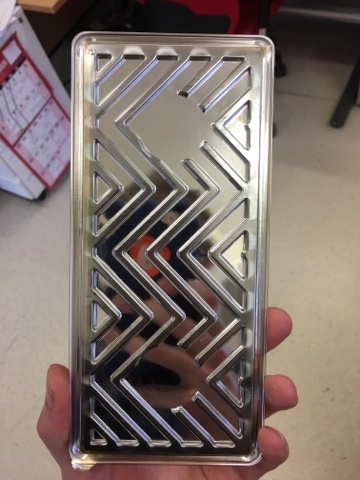 You could probably take very clever selfies in it. 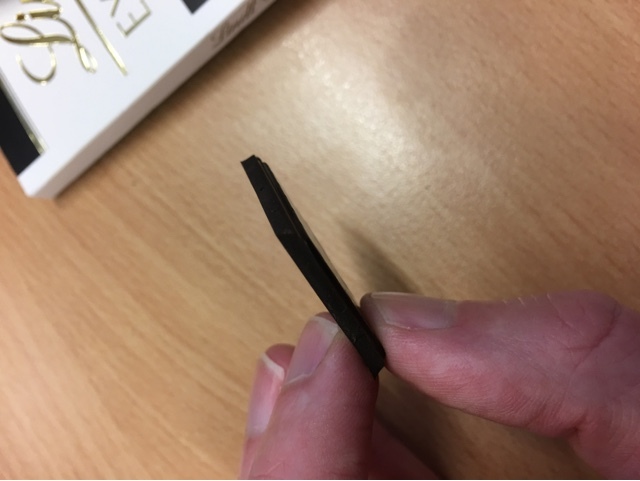 The chocolate is dark. Very, Very Dark. It's when you get to this point that you realise that they were not messing around. The smell is intense, and each little cube practically exudes evil. Well - I say cube, but this is a square - very 2D. And this is applauded - I think a portion for trial is a quarter of this. 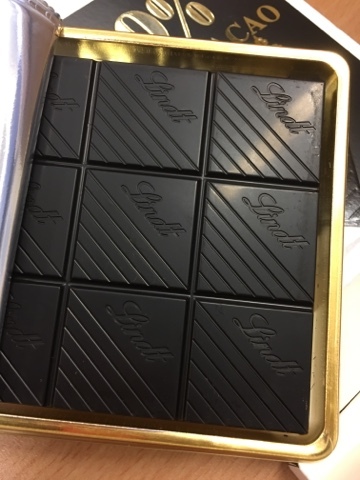 And it's certainly an acquired taste - it's not often people refuse chocolate, or bin some of the square you give them but both of these happened. I too can't really say that I love this as a food. As the experience, as the sheer concentration of cocoa though it's pretty special. The whole experience is just so un-chocolatey. It's practically a whole new class of confectionary. I plan to grate this and add it to things, and to eat it with things to create sensational new tastes. Think of this then as the shreds of chilli that show up in a stir-fry, the specks of ginger that make the meal explode and something that can turn ordinary home baking into a more gourmet experience. Coffee drinkers seemed happier to sit and eat this compared to regular people, and the sheer strength of this means it may be liked by smokers and the elderly, but your average person is not going to enjoy it. I finished both of the squares that i've had so far - and I'll be happy to eat more. Well - as long as I've got a nice coffee or a hot choc to reduce the power a notch. As a side note - a fellow shopper queried why the store didn't carry the mild versions of their dark range - both high in cocoa and milk by the sound of it - which means there are still varieties to try and that the chocolate exploration can continue. Anyone want to fly me to Zurich?